Now that is what you call consensus. Auston Matthews is not only No. 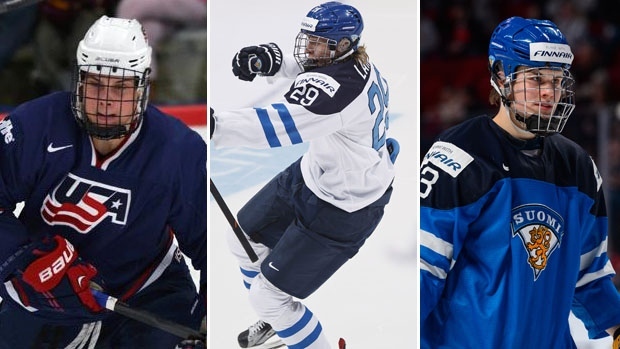 1 on TSN’s Mid-Season 2016 NHL Draft Rankings – 10 out of 10 scouts surveyed by TSN had the big American centre on top – but the Swiss League scoring machine heads up this year’s Big Three that includes Finnish twin towers Patrik Laine (2) and Jesse Puljujarvi (3). Not a single scout surveyed by TSN had any player other Matthews, Laine or Puljujarvi in their top three. Matthews, obviously, is the heavy favorite to be taken first overall at the draft in Buffalo on June 24, but it’s not an absolute slam dunk, despite going for 10 for 10 with our panel of scouts. They were pretty much evenly split. Matthews, playing for Marc Crawford in Zurich, is second in the Swiss League in goal scoring, with 24 goals and 40 points in only 31 games. Likewise, the scouts are somewhat divided on whether Matthews, who only missed being eligible for last year’s NHL draft by a mere two days, is in the same class as Buffalo Sabres rookie Jack Eichel, another big American No. 1 centre. Half said Matthews should be considered in the same universe as Eichel; half said he was just a step behind, perhaps with a better all-around game than Eichel but maybe not projected to be as dynamic offensively in the NHL. Laine is the clear consensus No. 2 choice over his countryman Puljujarvi. Seven of the 10 scouts had the 6-foot-4 Laine at No. 2 and 6-foot-3 1/2 Puljujarvi at No. 3. Laine was designated as perhaps the only prospect with a legitimate chance to challenge Matthews for No. 1. The race for No. 2 was close, but Laine got the edge over Puljujarvi for what a number of scouts described as his “dynamic” element. It’s a big year for American-born prospects. Matthews, born and bred in Phoenix as a fan of the Coyotes, obviously heads up the class, but Arizona-born, St. Louis-raised Matthew Tkachuk of the London Knights is No. 4 on TSN’s Mid-Season list. Sarnia Sting defenceman and dual citizen Jakob Chychrun, who was born in Boca Raton, Fla., and played much of his minor hockey in the U.S. before opting to represent Canada internationally, was No. 5. In addition to Matthews, Tkachuk and Chychrun, there are another nine American-born prospects in TSN’s top 30, including: Boston University defenceman and Long Island, N.Y., product Charlie McAvoy at No. 14; U.S national development program centre and Shattuck St. Mary’s/Illinois product Clayton Keller at No. 15; London Knight winger and Detroit-area product Max Jones at No. 16; U.S. national development program winger and Minnesota native Kieffer Bellows at No. 18; Wisconsin freshman centre and St. Louis-developed Luke Kunin at No. 19; Windsor Spitfire centre and St. Louis-raised Logan Brown at No. 20 (though the dual citizen has, thus far, opted to play with Hockey Canada); Minnesota high schooler Riley Tufte of Blaine is at No. 21; University of Connecticut freshman and Long Island, N.Y. product Tage Thompson is No. 28; and, Erie Otter winger and Michigander Alex DeBrincat rounds it at No. 30. It’s a big year for the Finns. It’s not unprecedented for a Finn to go as high as No. 2 overall – Florida took Aleksander Barkov second in the 2013 draft – but the prospect of Finns Laine and Puljujarvi potentially going second and third overall or one of them possibly being the top pick is incredible for the smallest of the world’s so-called hockey powers. Also, London Knight defenceman Olli Juolevi is No. 7 on TSN’s rankings, giving the Finns the potential to have three players chosen in the top five. Juolevi is mounting a serious challenge to Chychrun as the top defenceman available in this year’s draft. Woe, Canada. It’s not a great draft year for Canadian-born and -bred talent. Technically, Chychrun is still eligible to play for the U.S. or Canada internationally — he was injured and not able to play for Team Canada at the U-18 Ivan Hlinka tourney and didn’t make Canada’s national junior team in 2016, so he has yet to actually play for Canada in an IIHF-sanctioned event — but he’s opted to go the Hockey Canada route even though he spent the vast majority of formative minor hockey years in the U.S. There are only three born-and-bred Canadians in TSN’s Top 10 and they hold down Nos. 8, 9 and 10: Cape Breton Screaming Eagle winger Pierre-Luc Dubois is No. 8; Mississauga Steelhead centre Michael McLeod is No. 9 and Val-d’Or Foreurs winger Julien Gauthier is No. 10. Mind you, all three are considered blue-chip prospects. Dubois plays a high-end well-rounded game but has ample skill and hockey sense; McLeod is a big hard-driving, speedy centre who likes to pursue and possess the puck and can, at times, dominate games; Gauthier is an above average skater with above average size, speed and skill that allows him to play the role of a potential pro-style winger. Sixth overall is the lowest any Canadian has been taken in an NHL draft – netminder Brian Finley in 1999 — but the potential exists for Canada to set a new dubious mark this year. There are only 10 born-and-bred Canadians in TSN’s Top 30. It's not a great year for The Dub. The WHL has only only three prospects on TSN's Mid-Season Top 30‎. Calgary Hitmen defenceman Jake Bean, with 19 goals, is No. 11 and a legit threat to break into the Top 10. Kelowna Rocket forward Dillon Dube is No. 24 and Saskatoon Blade Czech defenceman Libor Hajek‎ is No. 27. This year, the British Colu‎mbia Junior League actually has more prominent Canadian draft prospects than the Dub. Penticton Vees forward Tyson Jost, who has committed to University of North Dakota for next season, is No. 13 and a threat to be taken in the Top 10. Vees teammate, defenceman Dante Fabbro, who is committed to Boston University, is at No. 17. There are, however, a half dozen WHLers ranked between 31 and 39. The Quebec League has three prospects in TSN's Top 30; the OHL has 11. Hockey does love its family ties. Matthew Tkachuk, of course, is the son of former NHL winger Keith Tkachuk. Jakob Chychrun’s father, Jeff, was an NHL defenceman. Mississauga Steelhead winger Alexander Nylander, No. 5 on the TSN list, is the son of former NHLer Michael Nylander and younger brother of top Toronto prospect William Nylander. Julien Gauthier is the nephew of former NHL defenceman Denis Gauthier Jr. Max Jones is the son of former NHL forward Brad Jones and Kieffer Bellows is the son of NHL second-overall pick Brian Bellows. Logan Brown is the son of former NHL defenceman Jeff Brown. There’s going to be a fierce battle for the consensus No. 4 slot, behind Matthews, Laine and Puljujarvi. Tkachuk currently owns that designation, but four other Top 10 prospects got consideration as the fourth best in this draft – Chychrun at No. 5; Nylander at No. 6; Juolevi at No. 7 and McLeod at No. 9. Dubois received some consideration as a top five pick and Gauthier in the top six. There’s going to be an even fiercer battle for top defenceman billing in this draft. Chychrun currently holds down that title but it may be a tenuous grasp. The Sting blueliner started the year as the undisputed top blueliner in the class, ranked No. 2 behind Matthews on TSN’s Pre-Season Top 15 rankings in September. Forwards Laine, Puljujarvi and Tkachuk have vaulted by him on the mid-season list and, even though seven of 10 scouts still ranked Chychrun as their current top defensive prospect, many expressed some reservations on which way his game is trending. Chychrun didn’t play particularly well in the CHL Prospects game in Vancouver two weeks ago – he apparently was sick but tried to play through it – and his overall game hasn’t developed like many thought it would. Some scouts sense he’s been feeling the pressure of it being his draft year. Whatever it is, many expressed concerned at the trend. “He has all the tools to be a top-pairing defenceman but he’s not playing like we saw him play last year,” one scout said. Meanwhile, other defencemen are stepping up. Juolevi was brilliant for Finland at the World Juniors. Three of the 10 scouts surveyed by TSN had Juolevi as their top blueliner. Some of the others who opted for Chychrun said it was a tough call and Juolevi is coming on strong, as are No. 11 ranked Jake Bean of the Calgary Hitmen, No. 12-ranked Russian Mikhail Sergachev of the Windsor Spitfires and No. 14 ranked Charlie McAvoy of Boston University. No goaltenders in the first round. That isn’t to say there couldn’t be one taken in the top 30, but none of them were consensus first-rounders in the TSN survey of scouts. The strong favourite to be the first goalie taken is Everett Silvertip Carter Hart, ranked No. 35 on TSN’s Top 60. Hart is one of five goaltenders ranked as second-round picks on the mid-season list. There is a really unpredictable element to this year’s draft outside of the top 20. It’s quite fair to say many of the players ranked between 31 and 50 are, to varying degrees, interchangeable with those ranked between, say, 23 and 30. A few really good examples of that are Vancouver Giant forward Tyler Benson, Brandon Wheat King defenceman Kale Clague and Regina centre Sam Steel. Benson was ranked 14 on TSN’s pre-season Top 15 in September and is No. 34 on the mid-season list; Clague was ninth in the pre-season and is No. 39 at mid-season; Steel went from being a Top 15 honorable mention to No. 41. Benson’s fall has been largely injury-related. He’s only played 28 games because of a variety of ailments that have effectively derailed his season. Clague and Steel have played a lot for Brandon and Regina, respectively, but have seen their consensus ranking slip considerably. That said, and this is where the volatility outside of the top 23 or so comes into play, Benson, Clague and Steel do have varying degrees of support as first-round picks. A few scouts have each of those prospects as potential late first-round possibilities, but more scouts have them outside the first round and some even outside of the top 60. So it makes the slotting process difficult for these wild cards. As the old saying goes, it only takes one team to turn a second-round prospect into a first-rounder. It is not a subjective evaluation or projection of which prospects we believe will be the best NHL players years down the road. Rather, it is an objective assessment projecting where in the draft we believe these prospects are most likely to be taken. By objective, we mean that our survey of numerical evaluations taken from each of 10 NHL team scouts are collated and plotted to create a “consensus” ranking. TSN’s final draft rankings list comes out the week prior to the NHL draft in Buffalo, June 24-25. * For goaltender statistics, Goals-Against Average appears under the 'G' column, Save Percentage under the PTS column.